If you’re like me, you’re curious to know what leading analysts have to say about the direct mail and digital marketing outlook for 2016 and beyond. 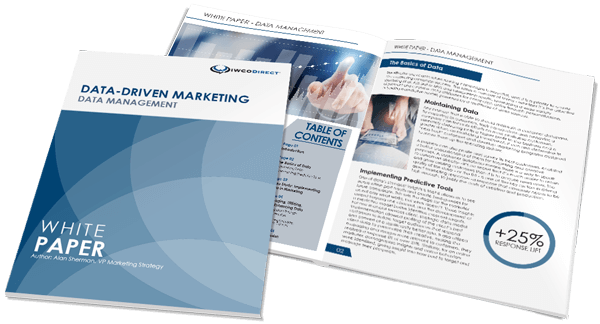 Last week I had the pleasure of attending a presentation by Bruce Biegel of the Winterberry Group on this very topic at the Direct Marketing Club of New York’s Annual Outlook Luncheon, and I wanted to share the information I gathered with you. Bruce always does a great job communicating and illustrating what has taken place and what will be influencing the industry and our clients’ marketing programs in the future. It was a rewarding confirmation of IWCO Direct’s value proposition and platform to hear Bruce say, “What really matters are data, analytics and creative!” Campaign management will also move from batch and blast to “always on,” meaning exciting growth potential for direct mail trigger programs. Biegel’s presentation was quite informative and the DMCNY did a great job with the event. I have been involved with the organization for more than 15 years and find it brings together passionate marketing professionals to educate, advocate, network and discuss all things marketing. It’s a unique group that has embraced industry changes and opportunities that are taking place at lightning speed. If you’re in the New York area and aren’t a member, I would encourage you to join.